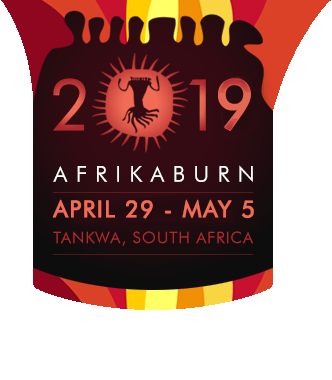 So here’s the deal: AfrikaBurn isn’t a music festival. And because it’s not a music festival, there are no DJ or live band lineups, and no headliners. In the dust, it’s the projects that are the headliners – and even those are largely only revealed on arrival. What AfrikaBurn is, is a self-organised experiment where you’re invited to create and collaborate. To find out how you can be part of the experiment by creating art or music, see below. Anything’s possible on the flat dusty plain of Tankwa Town – and you don’t have to be an artist or a performer either; all it takes is an idea, and the will to make it happen. Collaborate or don’t, whether you’re a pro or not, it’s simply about self-expression. Go as big or as small as you like: the only limits are your imagination. With that said, it is important to take responsibility. Anyone making a commitment to creating art at Tankwa Town must take responsibility for all aspects of that creation. From filling out the art registration form, participating in dialogue with the Art Wranglers, arriving at Tankwa Town, protecting your art, lighting it, maintaining your artwork during the event to cleanup at the end. It’s not a small undertaking but it is massively gratifying and Tankwa Town will love your gift. Things to think about if you want to make art at AfrikaBurn. Heads up: YOU DO NOT HAVE TO BURN YOUR ART! In fact, we strongly encourage you to consider creating art that can be dismantled and repurposed – as building materials for disadvantaged communities, or to live beyond the event, and bring joy to communities who could use some. Could your piece become a jungle gym, for some kids who’ve never had one? Maybe those beams could be used in building a roof? Think about how your piece will make a difference in the world. If you’re thinking about making art to burn, please read about building art to burn. And if you’re thinking about making art that will go on to have a second life, mail [email protected] so we can assist you with your plans. After you log into your Bio, you can either register a new Collective (or re-use the one that you created last year). Please read below how we classify the type of projects and which form you should use to register yours. Artworks are stand-alone physical structures built and placed on the Binnekring. They may burn or not. Registering an Artwork secures that your artwork will have a pre-allocated spot in Tankwa Town. But it does not secure that you will have a pre-allocated camp spot. Registering an Artwork to your Collective allows you to apply for a Creative Grant – and if your registration happens before March 28th 2019, your Artwork can be listed in the WTF Guide (our event guide) and also on our event app. Note: Artwork Registrations for this round close on April 1st. You have a performance piece? Great! If your Performance involves its own physical structure built and placed on the Binnekring, you will have to register it as an Artwork. Then list the actual performances as a “Binnekring Event” whether it is at an existing artwork, theme camp or mutant vehicle, or anywhere really, wherever whenever you feel it is right. Got something special in mind that’s not exactly a performance and not exactly a classic artwork but you want to put it out there on the Binnekring? Binnekring Events is the category for the listing of anything on the performance/gift/art juggling, musical, fire dancing freakshow spectrum that should be listed in the WTF Guide event schedule so that people can find it. This is where you list your “Mutant Vehicle Polo game”, your “bloody Mary extravaganza”, your parade, poetry reading…etc. Tankwa Town is your stage and your audience will find you! If you want to make sure our community knows about what you have in store, and can find it in the dust, register your Binnekring Event – before March 28th 2019 – and your Event can be listed in the WTF Guide and mobile app. For more info on Performances and Binnekring Events, click here. Note: Binnekring Event registrations end April 1st. A motorised piece of mobile art is called a Mutant Vehicle and they can include… anything, really: Couches. Bars. Jellyfish. Bees. Mice. Bunnies. Zebra. Pacman. As long as the vehicle has been significantly modified, then it can be classed as a Mutant Vehicle. If not, it doesn’t roll in Tankwa Town. Does your piece move by means of a motor? If it does, please register a Mutant Vehicle. Registering a Mutant Vehicle will also allow you to apply for a Mutant Vehicle Grant. Mutant Vehicle Grant applications close the same time as Creative Grants: October 28th. NOTE: Mutant Vehicle registrations close on March 28th 2019. Need info on Mutant Vehicles? Find that here. Theme Camps are designed and created with the intention of welcoming, engaging and entertaining other participants. Think of them as little villages within the larger village of Tankwa Town. Is your project a camp that requires a pre-allocated amount of space in a predetermined camping area of Tankwa Town? If so, please register a Theme Camp. Once your Theme Camp is accepted as such, you will be able to request placement. Do not register a Theme Camp if you you are just looking for placement and are not planning on having a public gift in your space. Registering a Theme Camp does NOT allow you to apply for any grant. If your Theme Camp has a specific artistic aspect to it, you can register your Artwork and then apply for a Creative Grant (but features that are integral part of the Theme Camp and cannot stand independently of it can’t be considered for a grant). For info on Theme Camps, click here. NOTE: Theme Camp registrations close on February 28th, 2019. Creative Grants are intended to help enable creative expression in Tankwa Town. If you have an Artwork or Performance project but you need financial assistance to bring it to life, you’re eligible to apply for a Creative Grant (if you’re looking to apply for a Mutant Vehicle Grant, you’ll find that info here). Please read everything about Creative Grants before you apply, thanks. The deadline for Creative Grant applications is midnight 28th October 2018. Our Clan sculpture is a physical representation of the spirit of AfrikaBurn: it consists of a torso with many heads and many legs and represents our community, as one. Find out more about the history of the Clan here. Don’t panic if it doesn’t look perfect, just like you’re envisioning your piece. It’s only a proposal and a work in progress. Your final proposal has to be in on 5th August 2018 at midnight – but don’t leave it for the last minute, as then we will not be able to assist you developing your idea if needed, and we might just be missing out on the most spectacular Clan ever! Practice Communal Effort and make it happen! Whether you are planning on bringing your very own creative project, or not, if art is your thing and you want to get involved in creative collaboration, this is for you. Do you love the Tankwa art scene and want to get involved with all of it at the same time? – You can! Read about the different ways you can enable art in Tankwa Town and support the artists in their creative endeavors, at the ARTeria. Building art in Tankwa is an extraordinary experience and a great undertaking. Possibly one of the most gratifying things that can happen to you at AfrikaBurn is working yourself really hard on building something beautiful. Do you think you could and would like to help make it happen? Then become an Artwork Volunteer! Our community values creative cooperation and collaboration. Are you a performer looking for a space to do your thing? Check out the projects that are looking for performers. Do you want to get involved, but you’re not sure how? See what the creatives crews are asking for.